While many hunters in Georgia prepare meticulously for their hunt and are well versed in the safety rules and regulations of their sport, they may still fall victim to accidents and injuries while hunting, either firearm-related or otherwise. If you have suffered an injury from a hunting accident, or if a family member has died as a result of a hunting accident, it is imperative to understand what happened that day and why. If someone else’s negligence contributed to your accident and injuries, you could be owed compensation for medical bills, ongoing treatment, lost wages, pain and suffering, and other losses. At Van Sant Law, we have extensive experience with accidental shooting and hunting injury cases – and we are dedicated to make hunting a safer and more enjoyable sport in Georgia. Call us today to find out more about your possible hunting accident case, or simply to get your questions answered about a recent hunting incident and injury. While some hunting accidents are simply unavoidable, many are found to be the result of negligence: negligence on the part of the hunter, another hunter, a property owner, a gun manufacturer, or a hunting product manufacturer. When we take on your hunting accident case, the first thing we will do is determine what happened and who was truly at fault. A hunter mistakes another person for a target. A hunter is under the influence of alcohol or drugs. An inexperienced hunter misuses a weapon. A hunter injures another person while violating state or federal hunting laws. 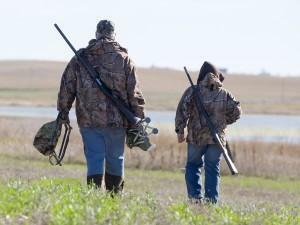 A hunter is harmed on private property that is dangerous or not safely maintained. A hunter is harmed in a tree stand accident, such as a fall. A hunter is harmed in an ATV accident or in another vehicle. A hunter is injured or killed in an accidental shooting. A hunter is injured or killed due to a gun misfire or gun malfunction. A hunter is injured or killed due to a defective product. According to the International Hunter Education Society, there are about one thousand serious hunting accidents in the United States and Canada annually. One out of ten of these accidents is fatal. Back, neck, and spine injuries. Gunshot wounds or bow and arrow wounds. These serious injuries can have long-reaching ramifications, not just for the injury victim, but also for his or her entire family. Getting the compensation you deserve can mean having the funds to fight against piles of hospital bills, missed time at work, and future medical treatments. Get Justice After Your Hunting Accident. Call Our Law Office Today. Hunting can and should be a safe, enjoyable, and respected sport. By taking action after a hunting accident, injury, or death, you are not only making certain that you get the support you deserve, you are also making sure that other hunters are protected from similar types of negligence. We offer hunting accident victims free, private, and no-obligation consultations. Call us today to schedule your appointment at (404) 991-5950 or fill out our contact form.